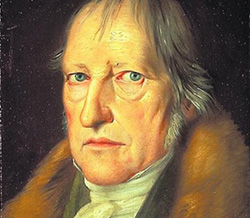 The German philosopher Georg Wilhelm Friedrich Hegel (1770-1831). "The Hagelian Dialectic" was the fantasy title for the column I published two days ago, "When AIPAC Went AWOL," one which rues the Israel lobby's passivity vis-à-vis Chuck Hagel's nomination as secretary of defense. This title refers to the German philosopher, Georg Wilhelm Friedrich Hegel and his highly elaborated dialectic theory of history (which Karl Marx subsequently drew on for his dialectical materialism). I will use it here instead. The Hagelian schema drama that played out over the past two months had Israel as the thesis, Obama the antithesis, and the Pentagon the synthesis. It is conceivable, though not likely, that Obama and AIPAC each knowingly played a Machiavellian game: Obama expected that Hagel's attacks on AIPAC would render AIPAC less likely to impede his nomination, so as not to seem petty. Conversely, AIPAC figured that Hagel's attacks on Israel would require him to reach out to it, so as not to seem insincere in his confirmation hearings. Whether or not these were actual calculations, they have in fact been borne out. AIPAC stayed mute; and Hagel has announced that his first face-to-face meeting with a foreign counterpart will be with Israel's Defense Minister Ehud Barak. Now, a second Hagelian triad, which I will explore here, considers the paradoxical grouping of AIPAC as the thesis, silence the antithesis, and pseudo-Zionism the thesis. Put in plain English, the fact that Hagel came to office with an anti-Israel reputation has both him and the Israelis straining to make nice. Despite major cuts to the American defense budget, Hagel promised in his meeting with Barak his intent to ensure continued funding for the Iron Dome and Arrow missile defense systems. Pentagon press secretary George Little explained that "during the meeting, Hagel expressed his strong commitment to Israel's security, including maintaining Israel's qualitative military edge and continued U.S. support for missile and rocket defense systems in spite of fiscal constraints." Little also reported Hagel's saying that he and Barak have had an outstanding working relationship and that he hopes to visit Israel soon. Mar. 12, 2013 update: In his last testimony as defense minister yesterday, Barak informed Israel's parliament that "There was exaggerated criticism" against Hagel. Mar. 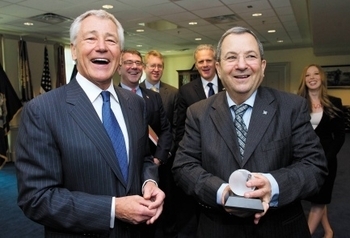 20, 2013 update: Hagel announced he is visiting Israel in April and had warm words for the Jewish state: "I appreciate the strategic relationship between our two nations and look forward to strengthening cooperation between the two defense establishments." Apr. 25, 2013 update: For an understanding of the new secretary of defense by means of the first British high commissioner to Palestine, see my weblog entry, "Viscount Samuel, Meet Secretary Hagel."